The image above says it all: Microsoft spent $26.1 billion to ensure that you’ll never walk into a meeting cold again. Picture a typical business trip: meetings all day, drinks at night. A good salesperson knows their contacts before they step foot in the door. But that goes for coworkers as well: How do you make them feel comfortable? How do you make them part of a team? How do you let them know whom to approach, both inside and outside the company? Right now, Cortana provides some basic information about your calendar, suggesting, for example, what time you’ll need to leave to arrive at your next meeting on time. 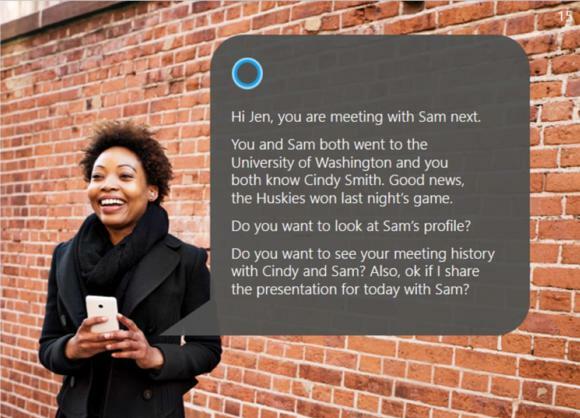 In Microsoft’s digital future, Cortana will be able to sum up what you need to know about your business relationship, and what information you can use to cement a more personal connection, too. It sounds smarmy, but a good salesperson will tell you that an emotional connection helps seal the deal. If you're bothered by the thought of Microsoft's owning more data about you—well, you probably should go delete your LinkedIn profile, now. Microsoft already knows your calendar (Outlook), your meetings (Outlook), your coworkers (Delve), your accounts (Microsoft Dynamics CRM), and some of your expertise (Delve). Microsoft calls this the Office Graph. Here’s what Microsoft and LinkedIn see the data they know about you. For his part, Jeff Weiner, the chief executive of LinkedIn, said his company envisions a so-called Economic Graph, a digital representation of every employee and their resume, a digital record of every job that’s available, as well as every job and even every digital skill necessary to win those jobs. LinkedIn also owns Lynda.com, a training network where you can take classes to learn those skills. Then there's the LinkedIn news feed, where you can keep tabs on your coworkers from a social perspective as well. Microsoft will use the LinkedIn information to empower applications like Delve—which is already part of Office 365. By making Office 365 a more potent application, Microsoft sells more Office 365 subscriptions, specifically to enterprises and small businesses—and possibly sells Lynda training subscriptions right alongside. There are already 1.2 billion Office users, and 70 million Office 365 monthly users in business, Microsoft said. 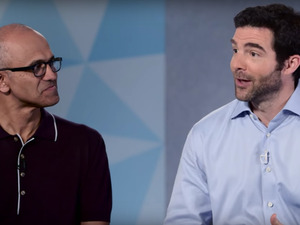 Add to that the 433 million users who have already signed up for LinkedIn (though only 105 million actively use it per month) and Microsoft feels like it can make the two networks, together, indispensable. Was that synergy really worth $26.1 billion, especially after Microsoft essentially blew $7.2 billionchasing Nokia’s handset business? Well, think about this: LinkedIn is essentially the Facebook of the business world, and the digital repository of most of the world’s resumes. You may lie to your friends about whether you like Journey, but very few people lie about their resumes to potential employers. And that’s information Microsoft is willing to pay for.